"How do you feel after hearing the thoughts and vows of the other volunteers? Are you touched and inspired? Indeed, hearing everyone's vows, I feel that it is in making great vows that strength arises. If we don't make vows or have an aspiration, we will just drift through life, ultimately letting our lives pass us by. Actually, our time in life is very short, only a few decades long. We should really cherish the time that we have." "In life, there is much that is beyond our control, such as where we are born or how long we will live. But what is even sadder is that most of us go through life blindly, led around by our desires, without knowing what life is about and not being masters of our own selves. Now that we have the causes and conditions to encounter the Dharma and furthermore practice the Bodhisattva Way, we really have to be earnest and diligent. In our Jing Si Dharma Lineage, realization of the Dharma comes not so much from hearing the teachings, but from walking the path—through our work, we come to realize life's truths and realities and experience the Dharma. We don't just hear about these truths and teachings, but we discover them, experience them, and realize them in the course of our work." "In our Tzu Chi work, every project to benefit the community is accomplished through the contributions of many people. A few people cannot achieve much; it takes many people's joint efforts. That is why whenever people praise Tzu Chi and put the spotlight on me, I always remind everyone that were it not for all the Tzu Chi volunteers, how could any of the work have been accomplished? People know me because they know Tzu Chi, and the reason they know about Tzu Chi is because you dedicate yourselves in your local community to serve and help people in need." "For this, we really need to thank the original volunteers who started Tzu Chi's work in your country, whom I call 'the first seeds'. They not only carry out Tzu Chi's missions locally, but also dedicate themselves to inspiring more people to get involved with Tzu Chi. They nurture people's love and kindness like a farmer looking after his or her seedlings. This is how from one Tzu Chi volunteer, there has come to be so many Tzu Chi commissioners and Tzu Cheng members in your country. 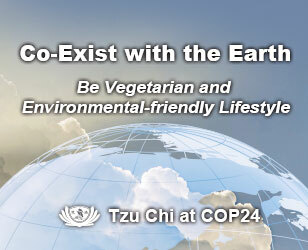 Remember, one person alone cannot accomplish Tzu Chi's work. Since it takes many people, we need to continually motivate more people to join us in doing this work." "Today, I've heard the thoughts and vows of many of you—elderly volunteers as well as young people in their twenties and thirties who joined Tzu Chi while in college and have continued to serve in Tzu Chi. Everyone's story is unique and is touching in its own way. 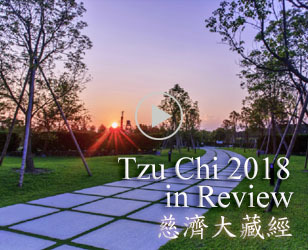 Many of you had to overcome many challenges to become certified Tzu Chi members. But, now that you have been certified, please remember the vows that you have made today. I will remember your words and vows to me. At the same time, please also remember my words to you. We need to keep these aspirations and teachings in our hearts always, and continue to pass them on to others." "I can see that you all truly believe in the value of Tzu Chi's work and have faith in walking this path. You will need to let your faith grow roots like the roots of a tree that become deep and wide-reaching." "We need to understand that life is very short. None of us know how long we will live—that is something beyond our control. But, we can decide how much breadth and depth to give our lives. This will depend on our beliefs and convictions, and how we choose to live. This is what faith is about." "So, having encountered a set of good teachings that truly show you the way in life, you need to learn these teachings earnestly and deepen your understanding and realization. This is also why I often tell you to refresh your understanding of Tzu Chi history. Don't think that teachings I taught a long time ago are outdated. I'm always grateful when I review this history. We started over forty years ago with just thirty bamboo coin banks from thirty housewives who put in a coin daily. This simple concept of making a small donation every day was what enabled us to start our work and to grow, to the point that now we are a global organization with bodhisattvas serving worldwide." "Recently, to help the survivors of Hurricane Sandy on the U.S. East Coast, we distributed US$600 cash cards and other supplies to over 10,000 families. But at each distribution, before giving the aid, our volunteers in the U.S. always tell the story of Tzu Chi's beginnings with thirty housewives and thirty bamboo banks. They repeat this story every time, no matter the size of the distribution. They never tire of retelling how Tzu Chi started and the power of tiny savings, accumulated daily. Though they kept telling the same story, the people who were listening were always different, and each time they told the story, people were very moved. When the people came to pick up their aid, they'd also put coins in the coin bank we had on our table. We didn't ask them to do this—they wanted to do this themselves. Some of them even asked our volunteers if they could take home a coin bank with them, and some even took home more than one so that each member of their family could have one. They understand that this is about doing a good deed every day." "So, our concept of the bamboo banks and saving coins every day to help others is something that many people in the U.S. are responding to and taking up. 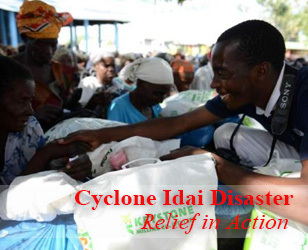 In the wake of this disaster, people's love is getting awakened. That's why I often say that in the aftermath of a disaster, many bodhisattvas will arise. The spirit of a bodhisattva is to feel for the suffering of others and to go to their aid to relieve suffering." "Our times are times of many disasters. Over 2,000 years ago, the Buddha could already see how in the future, Nature's delicate balance would become disrupted, leading to frequent and severe natural disasters. The Buddha could also see how there will be more wars and crises created by humankind at the same time, as the hearts of people at large become more impure and unpeaceful." "With violence and unrest as well as devastating disasters, there will be widespread suffering. At such a time, bodhisattvas are especially needed. The Buddha told us in the Lotus Sutra that anyone can serve as a bodhisattva. For people to become bodhisattvas, they will need to open their eyes to the suffering in the world and see how the suffering results from wrongful human actions based in greed, hatred, and ignorance. As these wrongful actions accumulate, the damage builds up until the impact becomes very serious and widespread. This is the so-called collective karma. The Buddha wanted us to understand this, so we can know the root cause of the problems we are suffering and know what we can do." "The Buddha wanted us to know that everyone can attain Buddhahood, but to achieve it, we need to first understand why it is that we have not been able to do this. This is because there are many temptations in the world and because getting caught up in them, we lose our way, creating negative karma and experiencing retribution. The Buddha tells us that the way to get out of this vicious cycle is to bravely serve as a bodhisattva in the community. As we give of ourselves to serve, we will encounter many people. Each person is like a living sutra from which we can realize the Dharma." "For example, earlier we heard from our volunteers in Japan that there was a child who fell from the third storey of a building. Unbelievably, the child did not suffer any injuries from this fall. Also, just this morning, I met a Tzu Chi volunteer who had just recovered from a shocking accident. When the accident happened, she was sandwiched between two cars, but incredibly, she only suffered leg injuries. The two cars involved in the accident were so damaged that they needed repairs, while this volunteer, sandwiched between them, actually didn't suffer more than leg injuries. I teased her, 'So who did more damage to who? Will you be receiving compensation from the drivers involved in the accident or will you be compensating them for the cars' damages?' Look at the inconceivable things that can happen in life." "We can only have positive karma and blessings if we create the blessings ourselves by doing good. We cannot get them by praying for them. In fact, when we seek blessings and do good with this kind of expectation of reward, we may not end up with many blessings from our good deed. The Buddha teaches us that we need to do good and give without seeking anything in return, and even do it with a thankful heart. The reason we need to be thankful is because doing good like this helps us to grow as a person and cultivate the bodhisattva spirit. We need to be grateful to have this opportunity to practice the Bodhisattva Way." "To attain Buddhahood and return to our innate Buddha nature, we need to first eliminate our afflictions and inner impurities. But it is by practicing the Bodhisattva Way and being tested in the difficult course of working with others and serving people in need that our afflictions really get to be worked on and eliminated. Can you understand what I am saying? So, remember, don't do good deeds with the motive to accrue merits and blessings. Just do the good deed because it is the right thing to do. That is the proper mentality to have." "Should something bad happen, you need to understand that this is due to your karma. Be thankful that this negative karma will be eliminated as you go through its retribution. As time passes, this negative karma will come to an end. Don't mistakenly think that it's Buddhas and Bodhisattvas who eliminated your negative karma for you. No, it is because as you go through the retribution, the negative karma gets 'used up' and is eventually exhausted. The Buddhas and Bodhisattvas teach us that when bad things happen, we need to keep an open heart and unafflicted mind and use the experience to deepen our wisdom." "This is the kind of inner cultivation that we need to do as we walk the Bodhisattva Path. No one can do this for us—as your teacher, I can only show you the way and point you in the right direction. It will be up to you to be firm about walking this path and persevering in this direction." А вот "Учет основных средств"вторая это уже "Учет основных средств"href="http://www.roboticsurgery.gr/logs/docs/uchet_osnovnyh_sredstv.html" title="Учет основных средств">Учет основных средств"href="http://www.roboticsurgery.gr/logs/docs/uchet_osnovnyh_sredstv.html" title="Учет основных средств">Учет основных средств"href="http://www.roboticsurgery.gr/logs/docs/uchet_osnovnyh_sredstv.html" title="Учет основных средств">Учет основных "Учет основных средств"средств"другое дело. Судебное "Учет основных средств"основных средств">Учет основных средств""Учет основных средств"href="http://www.roboticsurgery.gr/logs/docs/uchet_osnovnyh_sredstv.html" title="Учет основных средств">Учет основных средств"разбирательство закончилось быстро. Все равно что заподозрить Модюи или Грима. Знаете, Иван Петрович, в этой городской психушке есть, на мой взгляд, совсем здоровые люди. Стол окружен понтирующими; одни ставят на одну карту, другие на другую, третьи одновременно на две и больше, так что постоянно кому-то что-то выплачивают, постоянно стучат фишки и слышится звон долларов. Но магия сделала свое дело, догнать нас колдовством немыслимо.